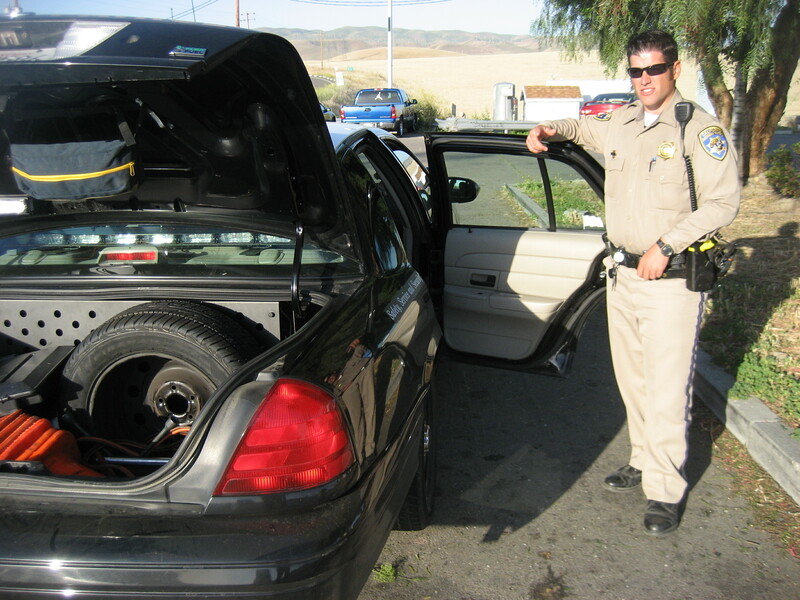 This California Highway Patrol officer drove me to a gas station near an I-580 onramp on my San Francisco-to-New Jersey hitchhike. The trunk is open because my packs were in the trunk. He was friendly but declined to shake my hand or give his name. In May of last year I quit my carnival job in Westchester, N.Y., in order to hitchhike to Chicago in time for my daughter’s 8th birthday. I gave myself four days to get there. The nearest highway was the Taconic State Parkway, which is beautiful but an extremely bad highway to hitch. No shoulders on the onramps. Nobody could pull over on the first onramp without stopping traffic behind them. My first ride drove me to the Clarence Fahnestock State Park and dropped me off on a feeder ramp with no shoulder. Cars went past far faster than onramps. A state trooper pulled up and parked in the middle of the feeder ramp, a line of traffic quickly backed-up behind her. I kept quiet but I could have told her the statistics. Freakonomics did a computer search on hitchhiking-related crime and found no significant correlation. Wandrly Magazine found a .0000089 percent of you getting raped or killed while hitchhiking. You’re more likely to stumble and kill yourself than die hitchhiking. There are no widespread injuries to drivers or hitchhikers in America today – here’s the California brain injury statistics. I have heard the myths but they are based on exceptions. As she checked my license on her squad car computer a driver behind her honked his horn. She stopped her license search, exited the squad car, went back to the driver and yelled at him from outside his driver’s side window. Another local police car maneuvered over the grass and pulled up too. He offered her his assistance. The two of them stood there with their emergency lights whirling, interviewing me as the traffic stood still. Later, she drove me to the next exit about 20 miles down the road. At Route 52 there is a small gas station and she dropped me off there with more stern, demeaning warnings. I regrouped for a while and walked to the back of the gas station to its dumpster. I found a box, tore off a lip and wrote I-84. I began hitchhiking at the front of the gas station, reasoning that it was legal to hitchhike on local roads. Another local cop pulled up and the routine began again. I told him that according to Hitchwiki, hitchhiking is legal on local New York roads. He was a young policeman who said he still remembered the code number making it illegal. When he left and I began walking down the road, it is 10 miles to the interstate. The rollers on my luggage long ago wore to the bone so I carried my luggage on my chest and my laptop knapsack on my back. At a side road I decided to put down the luggage and hitch again. This time three police cars pulled up. Six officers of the law stopped me within two hours. The sheer number of policemen in that short of a period was disorienting. I couldn’t afford the fine or jail time. “What am I public enemy number #1 fellas?” I said. I told this group of New York’s finest that I thought hitchhiking on side roads was legal and again I tried the Hitchwiki line. Their lights kept flashing. After a long conversation, they suggested I return to New York City by train and take a bus to Chicago. I don’t have the money for that, I told them. Then they recommended I walk the 60 miles to the Pennsylvania border but they weren’t sure what the laws are there. I never committed to walking. I did tell them, if necessary, I was willing to walk. They told the youngest cop to drive me to Fishkill. When he dropped me off, I promptly put my I-84 sign on the back of my computer backpack and began walking alongside the road. I didn’t have my thumb out but drivers from behind could see where I was headed. A couple miles down the road, up pulled a pick-up truck with a young father, his son and the family dog. Peter told me to hop in the flatbed. The young boy looked at me like a work of fiction, or history. He seemed more confused than the dog. I threw my packs in the back and jumped in with a ladder and lawn mower. The pick-up truck peeled away from the curb. Down the on-ramp for I-84 we sped past cars on our way to the Hudson River. It felt like an escape to freedom. 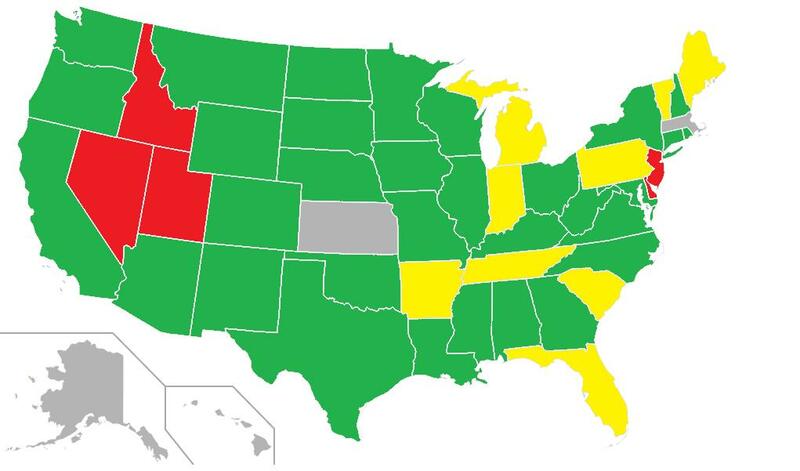 Overview of hitchhiking laws by state. Yellow: Hitchhiking legal while off the traveled portion of the road, stay in the grass to be safe. Red: Hitchhiking is completely illegal. Gray: Specific laws, check the respective state article(s). A section of Interstate 75 runs through the Florida everglades in Florida and is known as Alligator Alley. High fences line the east-west road to keep panthers, bears and alligators from crossing the road and causing an accident. A state trooper picked me up at a rest stop. He drove me to a gas station down the road on the Miccosukee Indian Reservation. He said I could get water and food while I wait. It is safer, he said. After a few hours hitchhiking at the station it grew late. About 9 p.m., I noticed a police car pull up so I left my backpack and “Marco” Island sign out front and ducked into the store. I wasn’t hiding, I didn’t want to flaunt my lawlessness in his face. He took it the other way. I felt a hard, aggressive tap on my shoulder. When I turned around a short, tattooed, bulked up reservation cop stood close to my chest. I’m about 6 feet 5 inches tall. He used his command voice (a police term for shouting) to order me back onto Alligator Alley. “A state trooper dropped me off here,” I said. “I don’t care who dropped you off here, get walking,” he said. It was too late to hitchhike Alligator Alley, I might cause an accident. I dug into the trash can for my sign and left the gas station. I walked into the everglades on a starry night. The vegetation buffered the sound of the road. It was oddly quiet. Sleeping in the swamp in my sleeping bag, I dreamt about a creature attacking me in the night. I wondered if I was really battling my subconscious. The next morning, it took a few hours but the next driver drove me to the front doorstep of my parent’s home. Hitchhiking my way through Canada on my way to Alaska, Canadian border guards x-rayed my backpack and searched my laptop. I spent five hours there and was escorted by a guard everywhere. On the way back, the Canadian border guard reluctantly let me through with a special, limited time certificate. I swear, if I had anything on my record or looked the least bit cracked, he wasn’t going to let me pass. None of that bothered me because the Canadians were so polite. But it was interesting being treated like such a threat to society. Five cops gave me lifts to better hitchhiking spots. Two cops gave me lifts but warned me not to hitchhike and then faked like they didn’t know I was going to hitchhike the moment they left. Each ride was sweet and badly needed. A cop in Deerfield, Fla. stopped his canine unit vehicle in front of me. He exited as the German shepherd barked in the back like he wanted to attack. Only thing that cop did wrong to me was laugh at me. “You know, you’ll never get a ride around here,” he said. Then he drove away and I walked down the street and began hitchhiking just outside the sign saying “Welcome to Deerfield.” He knew I would. After long, frustrating hours hitchhiking on the San Francisco Peninsula, a cop stopped me and explained he just wanted to find out if I was high or a wanted man. I later thought of the perfect answer. “Officer, I am neither high nor wanted. Quite the contrary, I feel quite low and unwanted. Most of the police I met were friendly. Some threatened to arrest me but that’s a big hassle for them too. The typical policeman was stuck between thinking hitchhiking is illegal and knowing he should let this slide. Hitchwiki says few states outlaw hitchhiking outright. Most states let you get away with hitchhiking in front of the sign banning pedestrians on the interstate. Hitchwiki said even in states where hitchhiking is legal, many police are convinced it is not. I was ticketed once in the 1980s in Virginia. The cop was stone faced as he wrote out the ticket. I wanted to say I wouldn’t be hitchhiking if I had the money to pay that ticket. He knew I was going to start hitchhiking the minute he left. He knew I was never going to pay that ticket. In all, more than a dozen cops stopped me during my year hitchhiking and I was never arrested or ticketed. The hitchhiker-cop dance is part of the price of the open road, never let the law stop you from seeing the world and the best way to travel. Know your right, follow Richard Harris Las Vegas car accident attorneys posts and know how to protect yourself. This story was about the cops I met during my 15,000 miles hitchhiking in 2013-14. I became the #1 hitchhiker in America, according to all the research I’ve conducted. I hitched to traveling carnivals in 10 states, traveling more than 20,000 miles, across America, Canada and Mexico. This entry was posted in Uncategorized on May 28, 2014 by admin. 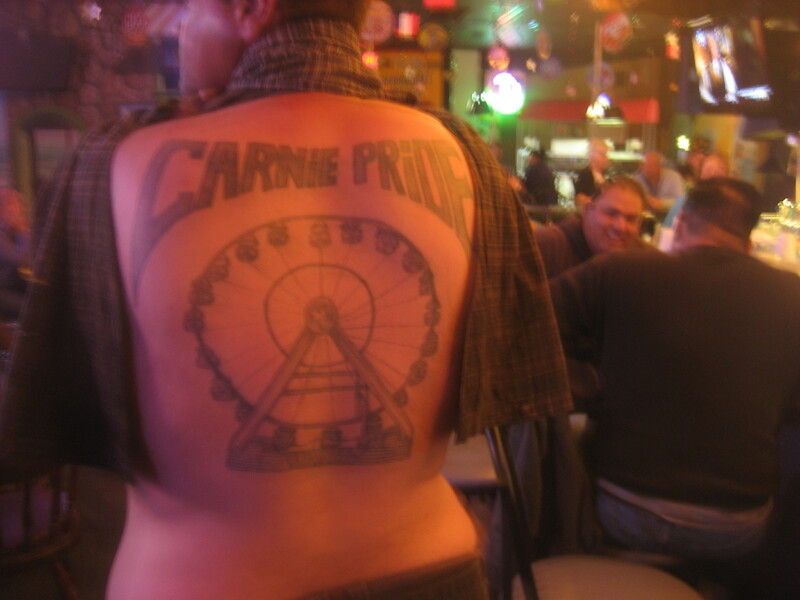 Showing off a full Giant Wheel tattoo on his back, this carny told me he was paid by an owner to beat another carny. Beatings are still a form of discipline in some traveling carnivals. 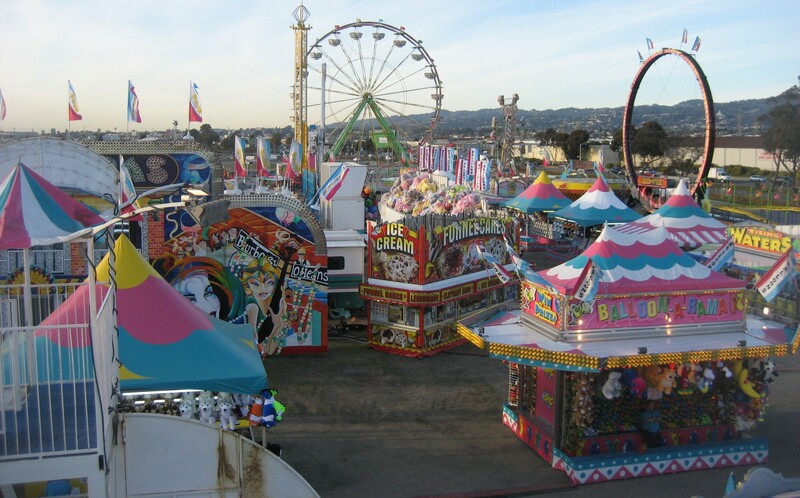 A circle of carnies stood in the a parking lot of Saint Timothy Catholic Church in San Mateo, California, and began telling “ooh that hurts” stories. We were setting up the carnival and somehow people started telling stories about how much it hurts to be shot, stabbed and to lose an ear and an eye. Which as a great man once said is, “both sad and ironic” because the Bible tells us St. Timothy was circumcised as an adult by St. Paul. I tell this circle of pain story because it reminded me of how traveling carnivals are so violence prone. More than a dozen times I came within a second of becoming a star in that “ooh that hurts” circle. In Alaska, a huge 20-something Samoan carny didn’t like it when I said he wasn’t the boss of me. “How about if I smash all your teeth out,” he said. I was angry at first but looked at reality, about 300 pounds of angry reality. I walked away but for another couple weeks he and his friends kept saying he was going “to eat” me. On my first all-night teardown of a traveling carnival, a former Grambling defensive back by the name of Rose Dog threatened to “f*ck” me up if I smashed his finger a third time. When I did, he screamed, danced in pain and turned to me like a bull. I stood ready for an onslaught from a younger, bigger man. I’m about six-foot-five, 200-plus pounds but I was 53 years old, he was in his 30s. I spent my adult life as a journalist. If I throw a punch my knuckles will snap, crackle, pop. My teeth might too if he ever landed a punch. But that night nobody “ate” anybody. Once, after an angry exchange, he vowed to “visit me” in my bunkhouse that night. It was a less-than-veiled threat to attack me in my sleep. I slept with a knife under the pillow. Carnivals have always had trouble finding workers so foremen go down to the homeless shelters or the churches to get the drug addicts and alcoholics. These poor men on the road to recovery, nevertheless, threatened to fight me at the state fairs of Minnesota, Oklahoma and Texas. In Texas, that group included a 400-pound man. In Chicago, after a 30-hour “slough,” a carnival term for tear down, I went nose-to-nose with a New Orleans carny over nothing. Violence is a traditional conflict resolution solution on carnival midways but I never once threw a punch or was hit. Rose Dog threatened to fight me several times in the two months I worked at Butler Amusements but when I left I believe he was genuinely sad to see me leave. I was genuinely sad I wasn’t 30 years younger. I seemed to constantly be walking on to the scene just moments after a violent encounter. I watched Rose Dog get up after a new hire clobbered him in his left eye, leaving a multi-colored Easter egg-sized shiner. Witnesses said Rose Dog flew backward through the carousel gates like a WWF jobber. I saw a couple men in Chicago Heights walking their separate ways after one broke a two-by-four over the back of the other. The most serious injury was to a girl in her teens in New Milford, New Jersey. After a night of arguing with her carnival boyfriend, she showed up to work with a face smashed to a pulp. She and the boyfriend denied his guilt. The only person who really was in danger that morning was me, who suggested we report the incident to the police. My most vivid carnival fight stories are the ones that involve me, but the most violent stories I heard second and third hand. There was the story of Ghost who someone said was shot for waving his money around too much on payday in New Jersey. Another Ghost was the dunk clown in Tennessee when he was shot by a local man angry at his taunts. A souvenir saleswoman in Chicago pointed to the midway we were working on in Gage Park and said she shot her husband four times in the legs on that very spot. She did it in front of cops, she said, and they turned a blind eye to it because they believed he was guilty of child molestation. In one van ride from the hotel to the state fairgrounds in Minnesota, Oz showed us all how “Mexicans” slit his throat from his left ear across his jugular and larynx. Then crew chief Chango showed us the bullet wound on his head and the knife wound on his bulbous stomach that weaved around like a question mark, with a belly button dot. Of course, everyone is proud of their scars. Hitchhiking in British Columbia, an old man picked me up and told about the tradition of Cree carnies in that part of Canada. Probably 50 years past between now and when he worked the kiddy rides but he remembers why he was nicknamed Fast Eddie. 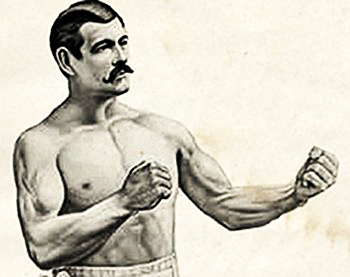 He once knocked a man down so fast, nobody remembers seeing him throw a punch. He proved it by showing them the flesh on his knuckles, a townie’s tooth still embedded. If you want to hear carny fight stories, go to the Annual Trade Show of the International Independent Showmen’s Association in Gibsonton, Florida next year, it’s the national convention of traveling carnivals in Carnytown USA. When told around the carnival bar in Carnytown USA, carnival fight stories are practically an art form. As with so many trades, the past glorifies the truth. People say times were tougher in the old days and carnies weren’t just fighting each other. Carnival games owner Adam West calls it the “pussification” of the midway. West claims there are far fewer fights and acts of violence. Carnies still box. I found this Internet link, you can clearly see a Ring of Fire ride in the background. The fight lacks the “sweet science” aspect I remember when I boxed and accidentally won the heavyweight championship at the University of College Cork, in Ireland. But this is a genuine boxing brawl. Millionaire Carnie Lee in California loved telling stories about fights with townies. In one fight, a townie was harassing a girl working a game. He promptly broke the townie’s jaw and later married, impregnated and divorced the girl. Fighting was the reason Millionaire Carny Lee said he doesn’t like Mexican carnies. He surmises they can’t be counted on in a fight. There may have been some truth in that, given that a single fight could result in a Mexican carny being deported. Fast Eddie said if a carny ever fought a townie, the local cops usually locked up the carny. Often that was the end of the line for the carny, the carnival would leave without paying bail. Tensions between townies and carnies are understandable given most games in the past were rigged, many still are. Sideshows, not as common today, might show burlesque or black magic. Daniel Pratt Mannix was college educated, as I am, and spent three years in traveling carnival sideshows. He wrote a seminal book on his three years in carnivals, called “Step Right Up,” Harper & Brothers, 1950. (I highly recommend both the book and looking up the life of Mr. Mannix). He describes a “clem,” a fight with locals in a small rural town. A sage older carny named Captain Billy told him why they occur. In the book, the carnies charge the hostile townies with wood boards, iron tent stakes and a whip, setting the locals to flee in a blind panic. I love the storyteller Mannix’s description of how the underdog misfits win. The modern day version of a clem is when a carnival sets up in a big city ghetto and carnies have to fight back against gangs. I can’t say if things were tougher in the old days but I can vouch that traveling carnivals are still macho zones with landmines for the working man. I worked at one carnival where I witnessed an owner threaten savage beatings to those of us he thought deserving. At another carnival, I didn’t hear the owner threaten anyone first-hand but we all knew the score. I knew a carny who said he was paid by an owner to gang up on a fellow carny. I met a carny who said his assailant backed out at the last minute but asked him to lie about it so he could keep the carnival owner’s money. How widely practiced this kind of carny discipline is, I don’t know. I can say, it exists and I believe I will be a target if I step on the wrong midway in the future. Tempers flare for millions of reasons, because people are too hot or too cold, hungry or thirsty, hung over or just ornery and sometimes because so little means so much. We all fight for our bit of colored ribbon, for what we want however small or grand. How strange is it then that people who work with their hands, fight with their fists. I recently completed “my time,” a year in traveling carnivals and hitchhiking around America. I worked in traveling carnivals in California, New Jersey, New York, Chicago, Alaska, Minnesota, Oklahoma, Texas, Georgia and Florida. I hitchhiked or drove more than 20,000 miles, across 36 states, Canada and Mexico. I’m seeking a publisher for a book. This entry was posted in Uncategorized on May 10, 2014 by admin. Monday’s post will be about all the fights, near fights and legendary fights of my year working in traveling carnivals. The heavyweight champion of University College Cork, Ireland, is looking forward to writing it and seeing what I mean by it all. This entry was posted in Uncategorized on May 9, 2014 by admin.